PLANO, Texas--(BUSINESS WIRE)--Jul. 9, 2018-- Cinemark Holdings, Inc. (NYSE: CNK), a leader in the motion picture exhibition industry, has enhanced the moviegoing experience for residents of Las Vegas with exciting auditorium updates at the Century 16 Suncoast theatre inside Suncoast Hotel and Casino in the Northwest Valley. Upgrades include Luxury Lounger recliners in multiple auditoriums, the addition of a Cinemark XD Premium Large Format auditorium and a brand-new café. Moviegoers can now enjoy the upgraded amenities and the café opening later this summer. Cinemark has replaced existing seats in eight auditoriums with Luxury Loungers, which are heated, ergonomic, electric-powered, plush, oversize recliners with extendable footrests and swivel tray tables. Guests can reserve these seats in advance, ensuring that they can enjoy each movie in their favorite spot. 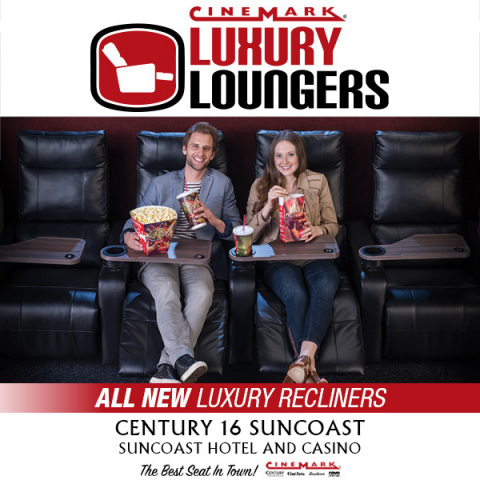 In addition to the Luxury Loungers, the Century 16 Suncoast theatre now boasts a Cinemark XD auditorium, which is the No. 1 private-label, Premium Large Format (PLF) in the world. This XD auditorium includes oversized wall-to-wall screens, custom surround-sound systems with crisp, clear digital sound, comfortable, plush Luxury Lounger seating, the brightest digital images and the newest movies every week. The new café will offer an expanded menu, including chicken tenders with wedge fries, individual pizzas, pretzel bites, churros and more. The theatre will also feature newly installed Coca-Cola Freestyle beverage machines, which are equipped with an easy-to-use touch screen that allows guests to choose their perfect drink from among more than 100 options. The café and beverage machines will be available for moviegoers to enjoy in August. In addition, the Cinemark Century 16 Suncoast theatre also offers a variety of discounts, such as early bird pricing for the first matinee showtime of the day and discount pricing for seniors, students and military personnel. Better yet, guests can sign up for Cinemark Movie Club, the monthly in-theatre membership program for $8.99 per month which provides benefits including 20 percent off concessions, rollover and companion tickets, reserved seating and no online fees. Cinemark fans are invited to stay connected through Cinemark’s social media channels at Facebook, Twitter (@Cinemark or #Cinemark) and Instagram (@Cinemark or #Cinemark). Cinemark is a leading domestic and international motion picture exhibitor, operating 533 theatres with 5,964 screens in 41 U.S. states, Brazil, Argentina and 13 other Latin American countries as of March 31, 2018. For more information go to investors.cinemark.com. Suncoast Hotel and Casino features eleven restaurants, a 16-screen movie theater, a 600-seat bingo room, a 500-seat state-of-the-art showroom and an 80,000-square-foot casino. Suncoast Hotel and Casino is a property of Boyd Gaming, a leading diversified owner and operator of 24 gaming entertainment properties located in Nevada, Illinois, Indiana, Iowa, Kansas, Louisiana and Mississippi.